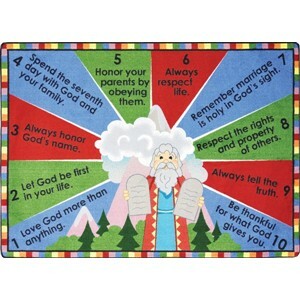 Save your Church money on the colorful “Bible Basics” faith based rug from Carpets for Kids. This fun play mat combines the ABCs with Bible stories for a fun learning experience. OUR SALE PRICE IS $196.77. Pastor owned and operated, Church Furniture Partner understands the needs of Churches and is ready to deliver the highest quality children’s carpets to your Church Sunday School. 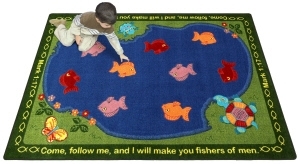 We offer a large selection of faith based rugs from Carpets for Kids and Joy Carpets. Give us a call at 419-469-6411 or fill-out the form below and one of our staff will contact you to assist with the nursery rug needs of your Church. Don’t worry, we do not use any high-pressured sales tactics.